Since I was a boy, I have always loved the literary genre of fables – fictional stories featuring animals with human qualities meant to illustrate some moral maxim. Like parables, such stories are never intended to convey meaning in every detail. Yet, much of it may draw, even in unsuspecting ways, the reader to precepts or principles pertinent to circumstances behind the story. Such is the following submission of a new take on Little Red Riding Hood. Once upon a time there was a dear little girl who loved her grandmother supremely. The grandmother had given to her a little cap of red velvet, which suited her so well she would never wear anything else. Thus, everyone called her Little Red Riding Hood. Grandmother lived far out in the woods and Little Red Riding Hood had never thought much about the dangers she might encounter as she entered the forest. Soon she would meet a wolf, a wicked creature indeed. “Good day, Little Red Riding Hood. Where are you headed so early in the day?” the wolf said. “What is it that you have in the basket?” he asked. “Where does your grandmother live?” asked the wolf. “Her house, picturesque, stands under the shade of a beautiful grove of strong oak trees, where refreshing waters pass in a brook, flowers grow, and the birds sing. Surely you’ve seen it before,” Little Red Riding Hood replied with innocent charm. 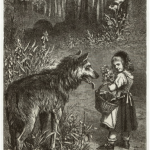 For a little while longer the wolf spoke with Little Red Riding Hood, mostly telling her about the way wolves are wrongly perceived by people. “Wolves are nothing to be feared, they just want to be treated like everybody else,” he told her. Meanwhile, the wolf slipped away and made straight for grandmother’s house ahead of Little Red Riding Hood. When he reached grandmother’s house, he knocked on the door. “It is Little Red Riding Hood,” replied the wolf. 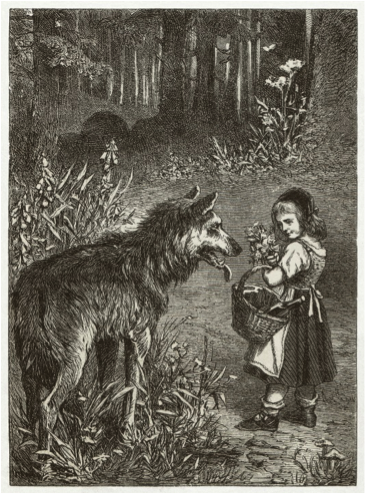 “I am bringing a basket of goodies to brighten your day – to bring about a whole new day for you, grandmother,” said the wolf convincingly. When grandmother lifted the latch to the door, the wolf devoured her. Then he put on her clothes, dressed in her nightgown and cap and lay in the bed as if he were grandmother. When Little Red Riding Hood arrived at grandmother’s house she was surprised to find the door ajar. There was something strange and uncomfortable about this situation, even unnatural, she thought to herself. As she made her way through the house, she came upon grandmother’s bedroom, and there laid her grandmother in her bedclothes with her cap pulled over her face, with the shades down, and looking inexplicably unfamiliar. “Certainly you can appreciate diversity,” replied the wolf. And just when he thought the time was right, he sprang from the bed to eat Little Red Riding Hood. A woodcutter nearby heard her screams and rushed to save her. He overcame the wolf with his trusty axe. The townspeople hurried to the scene, cheered and supported the woodcutter, except for five foolish judges. The five foolish judges declared the woodcutter prejudiced, bigoted, and intolerant. They said he had no right to defend either the grandmother or Little Red Riding Hood. They said the axe must be cast away. Standing with the five foolish judges were also some clever foxes, relatives of the wolf, who argued the wolf’s proclivity for carnage was completely normal. In fact, to suppress the wolf’s appetites, something which was inherent to his nature, would be wrong, they said. Besides, it was claimed that grandmothers are like old traditions that need to give way to the new anyhow. And so, on the basis of these considerations, not only did the mindset of many of the townspeople start to change, but the wolf was lauded and praised. Many townspeople would fly the wolf flag from atop their village cottages and buildings. An advocacy group called WUVS, standing for “Wolves, Underfed, Voracious, and Famished,” fought to give wolves special protections in law. And no one dared challenge the true nature of the wolf for fear his house, his livelihood, and even his freedom might be taken away. So the years passed, grandmother was dead and Little Red Riding Hood would live her life in confusion, always in danger of many wolves and never to enjoy the basket of goodies with her grandmother, whom she had known and loved for so long. I would not do all the work for the reader here, but if it helps, in this fable of Little Red Riding Hood, the Grandmother is traditional marriage. The wolf is homosexual activism. Little Red Riding Hood is an unsuspecting public, and, in another way, children and their future. The basket of assorted goodies signifies the many blessings and joys of real marriage. The woodcutter is true religion’s opposition to so-called gay rights. His axe is state constitutional amendments to define marriage as one man and one woman. The five foolish judges are the U.S. Supreme Court justices who ruled to redefine marriage for the nation. The clever foxes are professionals who argue homosexuality is inherent, fixed, unalterable, and normal. The townspeople represent ever-changing public opinion. Now that you have the key, perhaps you should it read again.